Standing on a surf board with the wind at your back, windsurfing across Brewer’s Bay is a great way to spend your day. 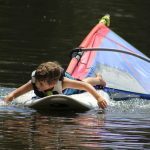 Every camper can learn to windsurf, and have fun doing it. 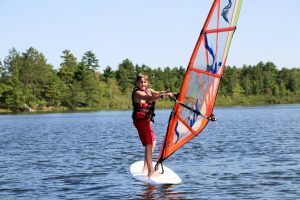 We start by getting the campers acquainted with the boards, learning to balance through games and challenges out on the water. 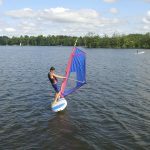 From there, we teach them the basics of the sails, and soon they are windsurfing their way around Spider Lake.